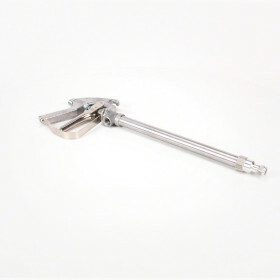 The TeeJet 13” Aluminum Spray Gun has an operating pressure of 200 P.S.I. and is built for heavy duty service. 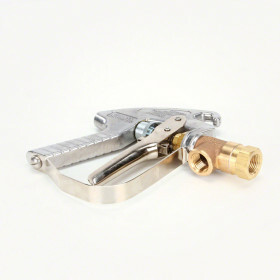 The spray gun’s stem extends through the entire extension length and allows for a drip-free shutoff and immediate operating response. 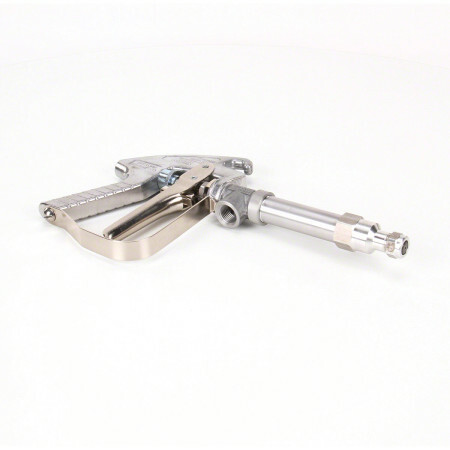 Designed and built for heavy duty service.Stem extends through extension to valve seat located directly behind orifice disc for drip free shutoff and instant operating response. Convenient trigger-lock for continuous spraying. Number AA43L for operating pressures up to 200 psi. 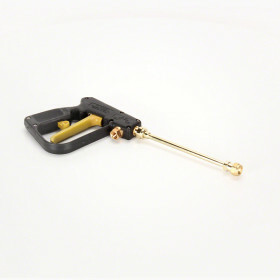 Trigger handle control: 1/2" NPT or BSPT (F) inlest connections. Exposed packing nut for easy adjustmentof packing. An excellent choice for spraying fruit trees. I have a 12V pump that builds 60PSI pressure. Gunjet does nice fan spray coverage for low branches to straight stream for reaching the top branches. I chose this gunjet because my sprayer came with a similar model that lasted for 14 years of trouble free operation until the packing failed in the back of the spray gun. Would recommend this spray gun to anyone else who has a small scale orchid that wants to use a commercial grade spray gun.